Mix one-part cooking technique, one-part recipe, one-part history and one-part friendship, and you have the soon-to-release Thursday Afternoon Cooking Club cookbook. 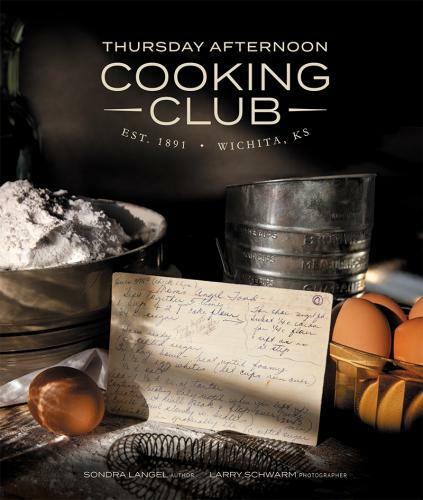 Author and philanthropist Sondra Langel brings the delicious story of the 127-year-old Thursday Afternoon Cooking Club to vibrant life in the 236-page combination cookbook and historic telling of America’s oldest cooking club. Thursday Afternoon Cooking Club is a story of cooking and eating and friendship. Started in a time when food prep was done on wood-burning stoves, the club evolved into a group that treasurers fine dining, lovely table settings and beautiful food. For more than a hundred years, they have collected recipes, traded secrets and studied the tools of home cooking. This book presents a colorful collection of tasty recipes as well as a brief narrative of food history and food science. It explores the changing roles of women from the 19th century into the 21st. Thursday Afternoon Cooking Club members have been gathering for more than 125 years. Each meeting features a luncheon and usually a demonstration of a new tool or strategy for cooking. They share recipes and critique dishes prepared for them. They listen to presentations on technique and explore the newest cooking equipment, from the 1891 Dover egg beater, through pressure steam cooking and the biscuit brake, to the latest electric crepe-maker. Thursday Afternoon Cooking Club is the second collaboration between editor Sondra Langel and photographer Larry Schwarm. The first was Wichita Artists in Their Studios, published in 2016. Its 50 portraits of both well-established and emerging artists showcases those magical spaces the public rarely sees – where the creative process takes place. Langel – a philanthropist, community activist and tireless volunteer – draws upon her years as a freelance writer to unearth stories worth telling and preserving. Once she embraces a project, she brings others into her vision and marshals the resources needed to see it through to triumphant completion.